It’s working! According to NZTA, West Auckland has the lowest incidence of alcohol related crashes in the Auckland Council urban zone areas. To recap the situation, The Trusts have been making this claim for some time on their website, in pamphlets, in the ‘Our West’ mailer and on-screens in their stores. I had a look at the data and I thought the claim was complete hogwash. West Auckland has the lowest population by a country mile (and thus the least crashes), but any reasonable analysis shows that West Auckland actually has a bigger problem with alcohol related crashes than the other urban areas. As I had suspected, the data hasn’t been treated to account for the different sizes of the zones. They are indeed taking the piss. 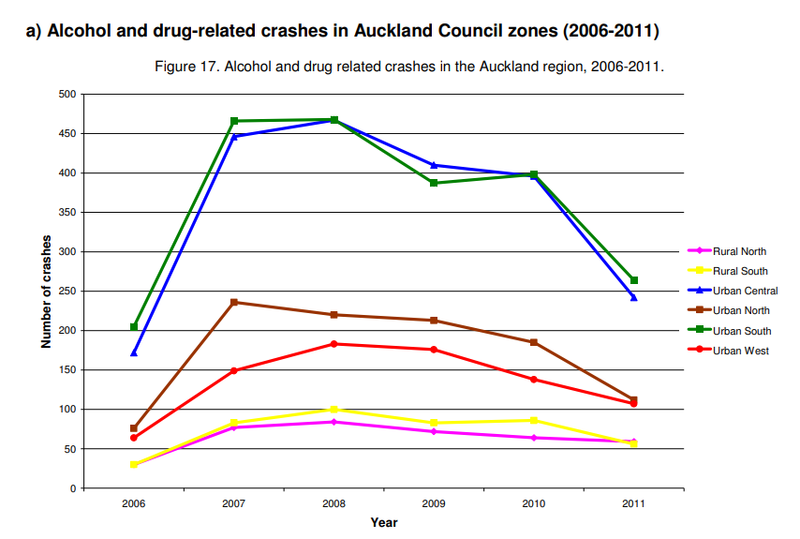 The claim is that West Auckland has the lowest incidence of alcohol-related crashes. This much is true, in 2017 there were fewer alcohol-related crashes in West Auckland than in other urban zones… This is not surprising as West Auckland has the lowest population of the four Auckland urban zones. … a smaller number of alcohol-related crashes occur in West Auckland than elsewhere each year, but that West Auckland has the highest percentage of crashes which are alcohol related. The data do not justify the claim. Despite this, in a split decision the ASA didn’t uphold the complaint. Their decision focused on how the average person would interpret the term ‘incidence’. They decided it would be interpreted to simply mean ‘number of crashes’, and therefore the critical statement was not misleading. They ruled that even though it might be utterly ridiculous for The Trusts to claim credit for a lower incidence, it is permissible under advocacy advertising rules. Whilst it’s a little difficult to fathom, the ASA decision isn’t a stinker. It is important that people are free to hold and express whatever opinions they like, regardless of how crazy they might be. And cherry-picking data or an unconventional analysis to back-up those opinions is fairly common. What’s unusual in this situation is that the tin-foil hat wearing crazies making a ridiculous claim are our Licensing Trusts – who are supposed to be working to benefit our community! I have lodged an appeal with the ASA, but I understand these are rarely successful so don’t have any expectation that the decision will be reversed. It’s a disappointing result but nonetheless, we now understand exactly what data underpins their claim and how absurd the claim is. I act for the Portage and Waitakere Licensing Trusts referred to as the Trusts. 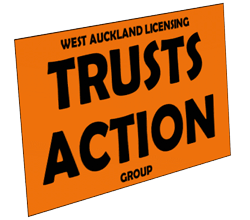 The operations of the Trusts is run through a corporate entity called West Auckland Trust Services Limited, WATS. The complaint from N Smale on behalf of the West Auckland Licensing Trust Action Group (WALTAG) suggests that there has been incorrect information relied on by the Trusts on the WATS website in terms of misleading use of data originating from the New Zealand Transport Agency (NZTA).If there is a breach of the Code of Ethics for advertisers, the ASA considers that Basic Principle 4, Rule 11 and Rule 2 are at issue. We got the complaint and we can read. It is alleged by N Smale that the statements appearing on the WATS website are misleading forms of digital marketing. The Trusts maintain that the data is being correctly relied on. The statements are not those of the Trusts, or the interpretation of raw data by the Trusts. The information on the website comes from independent research conducted by Dr Nikki Jackson, a Director of Alcohol Health Watch, and a complainant in a previous issue earlier this year. Dr Jackson’s report is attached as Attachment 1 to this letter. For completeness we have attached as Attachment 2 the Auckland Council report which although dated considers the range of issues in alcohol licensing which supports Dr Jackson’s report. What we said is true. Here’s the report we got the data from. We have discussed this subject of the complaint and the data with relevant officers from the NZTA and the NZ Police, and they have confirmed the information remains as presented in the Dr Jackson’s report. As such the information has not been removed from the WATS website. We’ve even checked with the NZTA and police. It’s all true! We’re not taking It down. The second issue with regard to this complaint is that the statements complained of are not advertising. The statements put on the website and appearing elsewhere are not forms of digital marketing. The statements are not made by the Trusts. These are statements of fact from a third party research paper. N Smale’s complaint is therefore incorrect in stating that the Trusts are misleading the public by advertising incorrect information. But it doesn’t matter anyway. This isn’t even advertising. Nothing to see here. The third issue with regard to the complaint is that the source of N Smale’s complaint is his own analysis of the data. The date he has relied does not appear to have been verified by the NZTA or the NZ Police. Therefore, the subject of the complaint appears to be without substance. The Trusts argue that N Smales’ analysis is incorrect and is uncorroborated by an expert in the field. The complaint is lacking in merit. Even if it is advertising. That chump doesn’t know what he’s talking about. Don’t listen to him. Lastly, N Smale and WALTAG are in essence competitors to the Trusts and barred from making a complaint to the ASA. WALTAG are currently seeking to establish an alternate framework to the Trusts to compete with the Trusts. The complaint to the ASA is without jurisdiction. He’s not allowed to complain anyway. He wants to have a vote about our monopoly and so he’s (sort of) our competitor. The Trusts maintain that the complaint is without merit or substance. Nevertheless the basis of the complaint appears to be misleading conduct in trade, normally overseen by the Commerce Commission or privately actioned as a tort in the High Court. So you should definitely just ignore this complaint. But if we need to talk about it, let’s go to the Commerce Commission or the High Court. That would suit us much better.